A key supply partner to the City Rail Link (CRL) project in Auckland’s CBD, Allied Concrete has received the ‘Champion of Change 2018’ Sustainability Award from Downer Soletanche Bachy Joint Venture (DSBJV) for their work on the CRL Contract 1 (C1). This stage within the greater CRL project includes the redevelopment of the existing underground rail network underneath the Central Post Office and lower Queen Street, linking the downtown Britomart Transport Centre to the Commercial Bay development and wider Auckland rail network. It is a very complex and challenging section of the project. Allied Concrete has been recognised for its efforts for the successful trial and implementation of bypass filtration systems and synthetic lubricants into their concrete vehicle fleet engines and drivetrains – thus improving fuel efficiency and significantly reducing oil consumption. The trial phase resulted in a fuel savings of up to 4.5 %. In addition, the use of Mobil Delvac 1 synthetic lubricants has enabled extended periods between oil drains from 500 hours to 1000 hours for vehicles running synthetic lubricants, and up to 2000 hours for vehicles retrofitted with bypass filtration and running synthetics. This is estimated to reduce annual oil consumption by 78 %. Partnering with Mobil Lubricants enables Allied Concrete to utilise Mobil Serv, a proprietary oil analysis programme that provides on-going data analysis and reporting on oil performance and component wear to aid in maximising the service life of each vehicle. Allied has converted all their concrete fleet nationally, including Auckland, to synthetic lubricants. All new trucks which have entered the fleet since that time, approximately 70, have been fitted with bypass filtration systems and a further 60 trucks, split between Christchurch and Auckland, have been retrofitted with these systems. Sarah Sutherland, Environmental and Sustainability Manager said it’s great to be able to recognise Allied’s efforts to challenge their business as usual. We have worked with Allied to develop sustainability targets relevant to the supply of their products to our project, and we monitor performance to ensure they are achieving sustainable outcomes. This initiative is above and beyond their sustainability targets with DSBJV. We have been really impressed with their passion for creating change in their business and it’s lovely to be able to recognise their efforts with this year’s sustainability award. Images: Top, Dale Burtenshaw, DSBJV Project Director presents the award to Steve Urquhart, Allied Concrete Commercial Sales Manager. 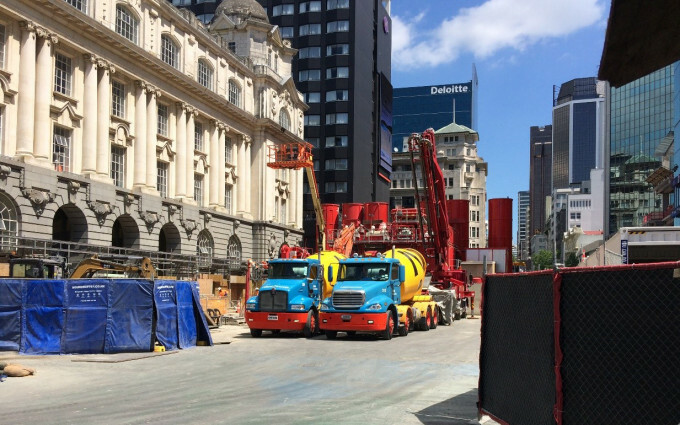 Below, Allied Concrete trucks on-site at C1 Britomart during a concrete pour.